This issue is devoted to a single article by another long time OWA member. The topic is also close to my heart since I too was a friend of Nancy Florence, a rare and wonderful architect, and of the author, Bobbie Sue Hood. It has been a privilege to go through life with such talented architects and wonderful women. The OWA has been and continues to be central to our knowing each other and appreciating such pioneering women architects who were part of a vital movement for women's' rights in architecture from the 1970's. It also allows us all to meet new generations of talented women who will carry on the effort. At the Retreat we will be nominating at least four new Steering Committee members, and the roles of new and old members will be distributed among next year's Committee. The statements below from current members briefly describe the pleasures and obligations of our five Coordinators. Please think about what you would enjoy doing if you were on the SC, and perhaps consider offering your services! When someone is seeking to connect with the OWADP, the Information Administrator is often their first point of contact. My favorite recent example was a Girl Scouts troop looking for an office with woman architects they could visit. As with all positions on the Steering Committee, you also have the opportunity to initiate projects you believe will benefit our members. I am excited about our new efforts to facilitate members sharing our collective wisdom. Stay tuned for updates on that in future newsletters and at the retreat. As the OWADP Policies and Procedures Coordinator the biggest part of my job is running the Steering Committee meetings and the annual business meeting. Every other month the Steering Committee gets together to plan OWADP events and talk about long term goals. I write the agenda for each meeting and make sure things run smoothly. I love getting together with the Steering Committee to brainstorm exciting new ideas for the OWADP. It is a fun and challenging job that has helped me get to know a lot of the other members. Six issues a year of our newsletter are published on our website, and are easily put into HTML (without needing to know it) by Bill Hocker’s template with convenient and elegant formatting. The newsletter generally gives an account of recent tours, announces upcoming events, and includes articles by and about various members. Some historical extracts from early newsletters have been included where they seemed relevant. Not everyone may read the newsletter on line, so soon we will be mailing hard copies to members in good standing, and to members who have recently lapsed. It has been great fun, and the help of Jean Nilsson (previous editor) has been invaluable. Programs and events are a way for OWADP members to get together throughout the year. Programs are scheduled every two months and as coordinators, you can select from among the countless opportunities in the Bay Area for tours, speakers and discussion panels. You also secure the venue and provide refreshments if appropriate. Over the past two years our experience is that people are incredibly receptive to being a part of/hosting a OWADP program. As a coordinator, it's also a way to utilize/expand your network...it is actually quite easy to fill the calendar. The primary responsibility of the Public Relations Coordinator is to promote and represent the organization. I am always happy to speak to others and do my best to encourage membership and attendance at events. I maintain the OWADP Facebook and LinkedIn sites, and also serve as a liaison between the Logo Pod and the Steering Committee. To further visibility beyond our web presence this year, I proposed a physical flyer, which was posted at local schools, bookshops, and community boards. While working on this, I had the pleasure of collaborating with the steering committee, members, the community, and even connected with an architect in Iceland to get permission to use a photograph of her building I took. The membership coordinator keeps track of the membership and the current status for all people in the OWADP database. Her job includes trying to evaluate fluctuations in membership and determine how to increase membership. She devises ways to encourage lapsed members to rejoin OWADP, and ways to encourage non-members to join. Writing to members, outreach and communication are important aspects of this job. Nancy Florence was among the first OWA members in the early 1970's and an early Steering Committee Member. Her life and her career illustrate the gifts and resources women have brought to the design professions, our struggle to be treated the same as male architects, and our search for training and technology to create buildings and find clients with like values for whom we can create work we are proud of. Nancy and I have been friends since before she formally decided to become an architect. In a way, Julia Morgan introduced us - I met Nancy at a talk and slide show which Sarah Holmes Boutelle gave as Sarah began research on Morgan's 800 buildings - about 1974 or 1975. But Nancy's interest in landscape and the relationship of culture, climate, and topography to the arts began long before that. "My mother was heavily influenced by the example of her aunt, Rachel Cohen, an artist and independent, single woman in Los Angeles during the early 20th Century. Aunt Ray made her own clothes, ceramics, lamps, stationery, textiles. I think Aunt Ray inspired Nancy to want to create beauty in every element of her environment and to feel she could learn and turn her hand to almost any craft." Nancy studied botany as an undergraduate at UCLA - drawn by how plants vary according to climate and geography, and thrive by adapting to their environments. They fail by not adapting or by not adapting quickly enough to changing environments. She brought this principal to her architecture. After college, she taught in Japan, outside of Tokyo, for a year. She noted the dialogue between traditional Japanese buildings and their landscape settings - often carefully contrived to look natural. She was fascinated by how good design using high quality local materials and fabrication processes could make useful objects beautiful - fabrics, paper, knives, bowls, teapots - no matter how utilitarian. Nancy married and had two children, Rachel and Treven Baker. The family settled in Portola Valley, CA, near San Francisco Airport, where her husband John, a pilot for United Airlines was based. She used air travel privileges to visit friends and family living in India and Africa.. She observed local design values, construction techniques, relationships between buildings and their natural surroundings, and everyday objects. She saw how different climates, geography, topography and cultures influence local values and design.. 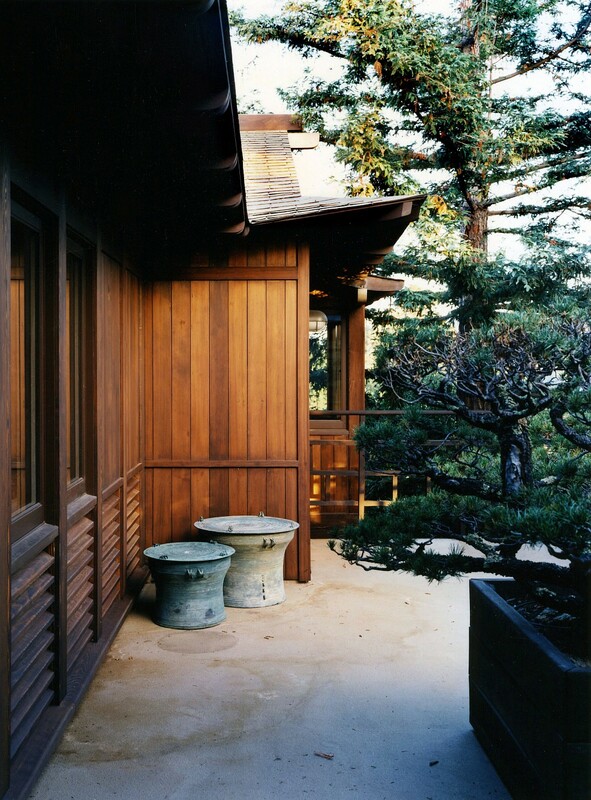 Her love and understanding of Japanese art and culture influenced her first remodeling project from the early 1970's – an addition to the family house on acreage in Portola Valley. This was before Silicon Valley was a synonym for young, rich, high tech billionaires who drive the economy. Locals still kept horses and lived in relatively simple rural houses.. Rutty roads reached unassuming houses sited for convenience and view rather than creating an urban block façade. To remodel her family's home, Nancy chose a prominent Palo Alto architect to advise her, Morgan Stedman, just before he retired. Morgan's values matched hers, so he agreed to work with her as the primary designer, to teach her about structure, construction practices, and how to specify and find materials and subs. Their major addition and remodeling of Nancy's house was her first project and his last. He encouraged her to go back to school and become an architect. 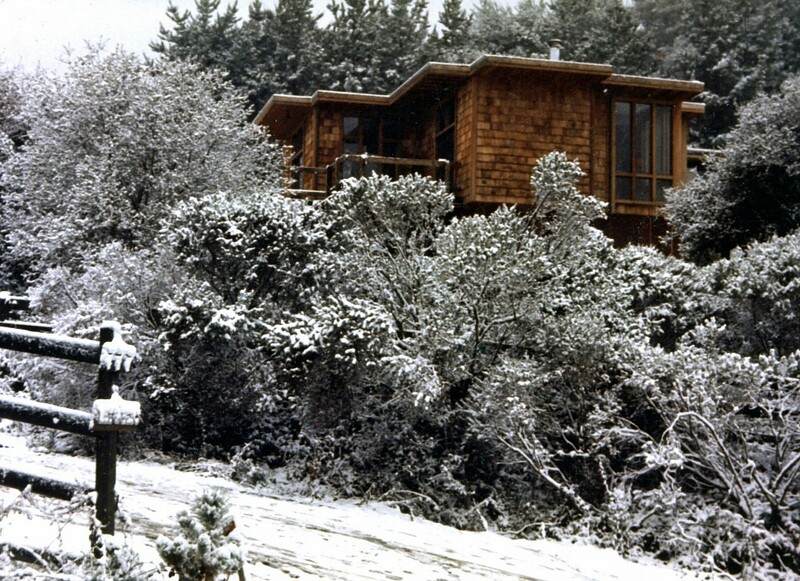 Photos of the house reflect values which Nancy continued to develop during her entire career: site-sensitivity; plants as contributions to the building; fenestration to balance natural light, practical preferably natural, materials used in simple, elegant ways to solve problems aesthetically, and exposed structure for decoration and reassurance in earthquake country. 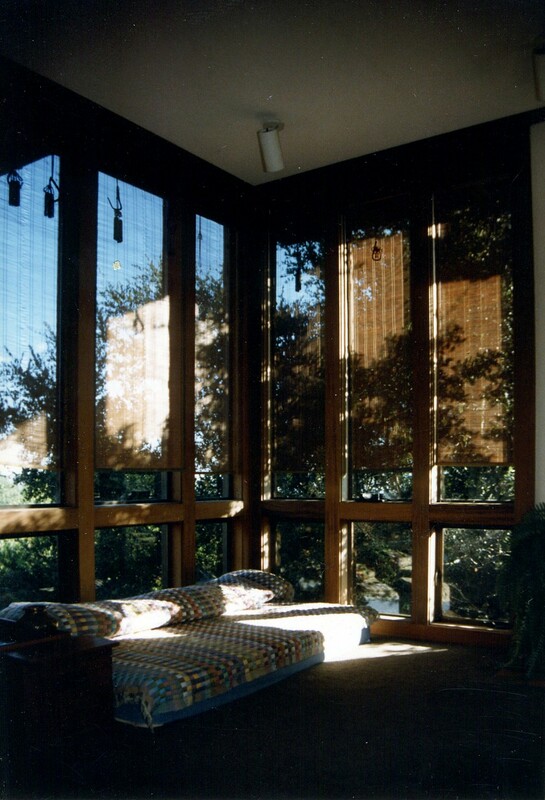 Living room of Nancy's first project, an addition to her own family house in Portola Valley in 1974. 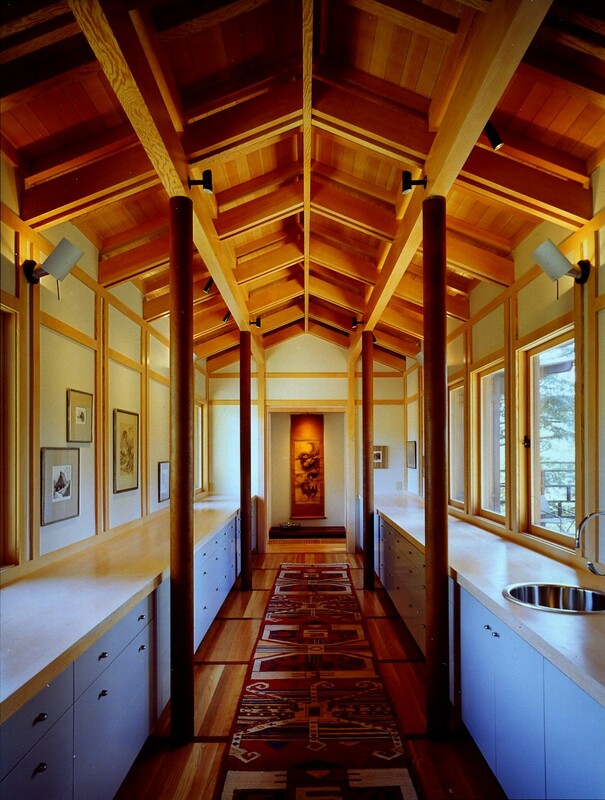 Her love and understanding of Asian art and culture influenced her first remodeling project from the early 1970's - her house on acreage in Portola Valley. This was before Silicon Valley was a synonym for young, rich, high tech billionaires who drive the economy. Locals still kept horses and lived in relatively simple rural houses, with kids who joined 4H clubs. Rutty roads reached unassuming houses sited for convenience and view rather than creating an urban block façade. To remodel her family's home, Nancy chose a prominent Palo Alto architect to advise her, Morgan Stedman, just before he retired. Morgan's values matched hers, so he agreed to work with her as the primary designer, to teach her about structure, construction practices, and how to specify and find materials and subs. Their major addition and remodeling of Nancy's house was her first project and his last. He encouraged her to go to graduate school and become an architect. The Portola Valley addition in a rare Bay Area snow. The Portola Valley project whetted Nancy's passion for architecture but having two school age children presented challenges. She overcame these, step by step. Another example from the watershed 1970's was discovering and publicizing how successful Julia Morgan's career had been. At age 65 Sarah Holmes Boutelle retired from heading the history department at The Brearley School , a posh girl's school in Manhattan. Sarah sold her family farm in New Jersey and moved to Santa Cruz, California to settle near her sister Mary Holmes, who headed the Art History Department at UCSC and painted. Sarah Boutelle was personally so warm and engaging, enthusiastic, that her lectures fostered many women's and young architects' friendships. For young women architects facing challenges in our own careers, Morgan's story was encouraging and reassuring. Sarah had begun giving lectures and slide shows on Julia Morgan in "newly re-discovered" Julia Morgan buildings. (3) Nancy Florence and I met at one of Sarah's first JM presentations. All three of us hit it off immediately, had a good time and remained lifelong friends. In the 1970's pioneer women architects were enthusiastic, courageous, energetic, and naïve about organizational skills. We were optimistic that we could improve the world, and it wouldn't take too long, either. Seven women in architecture, planning, and architectural criticism, including me, met at a conference at Washington University in St. Louis about 1974. Before we left St. Louis, Leslie Weisman, who was/is not an architect but teaches architects, said "Let's have a school!" and six of us immediately agreed. Mostly from the East Coast (I was initially the only westerner), we were determined to create the Women's School of Planning and Architecture (WSPA, pronounced "Whispa"). We were out to change the world fast and still believed that was possible. WSPA's first summer session was in 1975. These ad hoc groups like OWA and WSPA tackled issues from many directions, with humor, mutual support, and job referrals. We also wanted to celebrate women's work and publicize their projects. In the process we also created lifelong friendships. We founded, financed, and produced WSPA's first summer session at Biddeford College in Biddeford, Maine, a derelict former mill town, on the Atlantic Ocean. Creating the organization, raising the budget, renting a dormitory and other buildings on the campus for two weeks, organizing the program, and advertising to prospective students required long, complicated discussions for consensus - every decision had to be made by unanimous consent. Long distance logistics were tremendously expensive and time consuming before the digital age and email - a time sink. Nancy told me a few years ago that my class that summer in Biddeford was the best class she ever attended which meant so much to me. I thought it was my most successful class because it was the only one I taught for which I alone was responsible. I never taught formally again, but often felt that I ran a graduate class in my office. Nancy and I stayed in touch as our lives changed during this period. We had fun as well as worked hard. The best thing about my position at the State Architect's Office was that it sometimes gave me opportunities to recommend the best people for various projects or commissions who were, often coincidentally, women. I recommended hiring a good design firm where Cathy Simon then worked was a Principal and chief designer, Marquis Associates. They were selected for the largest project that her firm had ever done at that time - the State Department of Justice, for which I had not only written the organizational and urban design program but also prepared the conceptual design. I also had an opportunity to improve architectural licensing procedures by recommending a public member to the State Board of Architect Examiners (today called the California Architects Board). Governor Brown supported consumer protection and had signed introduced and signed legislation requiring two public members for every professional licensing board. He was (and remains) strongly committed to full participation for women and minorities. So when Sim asked me for recommendations to the public positions on the architects' board, I highly recommended Nancy Florence (then Nancy Baker). Governor Brown appointed her to the California Architects Board in 1976. She served for 3 years with distinction. Nancy told me how she confronted prejudice from a male Board member with her characteristically gentle but rapier humor. When he asked her what her husband did at lunch, she replied by asking him what his wife did. She was fearless and polite - a disarming combination. No matter what the circumstance or title of her colleagues, she was firm in her commitment. She insisted on and got more women architects appointed to be test reviewers and also to provide personal interviews of all candidates who had passed the written portions of the exam. Although many of her earlier interests and her undergraduate degree in botany had informed her design ability and interests, Nancy's late start on her formal career in architecture limited the scope of her projects and clients. After she received her professional degree from Berkeley, Nancy interned with Polly Cooper and Ken Haggard at the San Luis Obispo Solar Group. (9) SLO Solar Group has designed and built passive solar buildings which have functioned off the grid since the mid-1970's. Ken and Polly taught environmental and energy-efficient design in the Dept. of Architecture at the California Polytechnical Institute San Louise Obispo (CalPolySLO). As soon as she was licensed she chose to work as a sole practitioner, and hired architectural and structural consultants as she thought necessary - an ingenious solution to field experience. There is no debate about how design decisions were made - Nancy made them. There is a remarkable consistency in style and problem solving among all her projects. But her way of working as a sole proprietor necessarily limited the size and scope of her projects. Her local consultants also helped to make her projects more site specific. It was part of her goals to use vernacular forms and construction. The step tansu is built into the house and serves as a staircase to a sleeping loft above which stretches between the trusses Nancy designed to be decorative as well as structural. 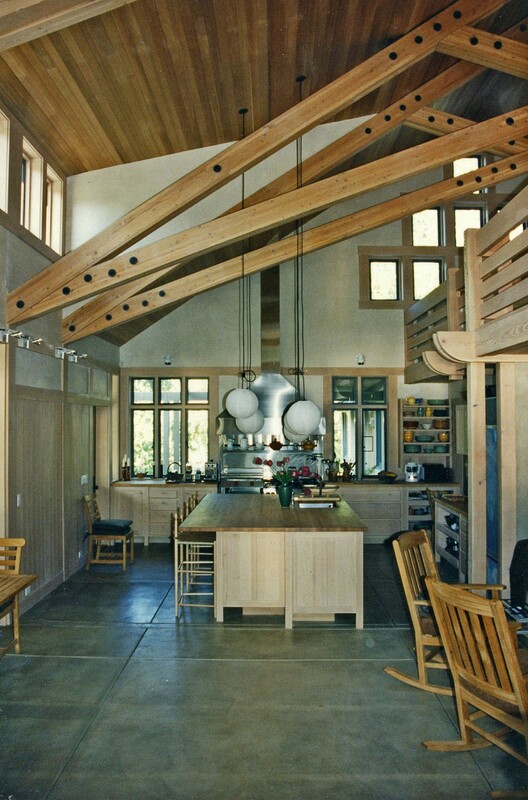 The open kitchen and dining area of the Edgewater house in Ketchum, Idaho, that Nancy designed for the Shapiros has facilitated many warm gatherings of families and friends. Note how the poured concrete floor ties in with the overall module of the house. An example of such regional vernacular design was the house Nancy designed for her sister and brother-in-law, Shirley and Ralph Shapiro in Sun Valley, Idaho, at Ketchum. I had the joy of visiting the house in Ketchum just before it was completed in the early 1990's. It nestles close to a rushing mountain river and is suitable for year round living and family vacations. Nancy was wary of building so close to the river. But both the clients and architect were drawn to the river which is very beautiful - the focal point for the architecture so they discussed the risk and agreed to take it. But thus far, it has survived intact. It is raised 3 feet off the ground. Everyone agrees that being so close to the river has been worth the risk. Nancy said she accepts that the river may take the house, but it will be OK because she made the superstructure biodegradable. A generous deck wraps around three sides of the house on the sides closest to the Big Wood River, providing views of the river and a sense of graciousness to the entire composition. The modular repetition, similar to the use of the tatami mat module in traditional Japanese houses, appears in Nancy's Ketchum and Portola Valley houses. Working with Nancy was a unique experience since as sisters we shared a similar aesthetic, probably influenced greatly by our Aunt Ray, an art teacher and a dominant figure in our lives…especially for Nancy. Nancy taught me so much about how to construct a house well-suited to its site. During the design process, one of the first things she did was to seek out a competent local architect (Jonathan Marvel) to use as a consultant, who understood the stresses of our geographical location with its broad climatic swings of cold winters with heavy snow loads and hot summers (in the 90s to 100+ degrees). What concerned Nancy the most was the possibility of massive snow build-up on the roof so she designed a support system of 4 handsome scissor trusses to carry the heaviest load possible (the contractor claimed we could drive a tank across that roof). She also specified extra thick exterior walls and was adamant about not allowing anything to compromise their insulating quality. For example, I wanted to have a recessed toilet paper holder in 2 of the bathrooms where they would need to be placed in an exterior-facing wall……. 'absolutely not', said Nancy. Nancy taught me so much about what makes a house comfortable and livable. When it came to laying out the rooms, Nancy recognized that on warm sunny days we would gravitate toward the light and sit on one of the several window seats out under the strong scissor trusses and under the soaring light-filled cedar-clad ceiling where we could look out at the river and landscape or just relax and read by the good available (natural) light. But, when evening came and the temperatures dropped, she knew we’d want to retreat to a cozier location, a sofa-lined inglenook by the fireplace, with a lower ceiling, a warmer, enveloping escape from the night-time darkness and temperature drop. We love the aesthetic design of the house, which she named “Idaho Vernacular” because of its barn-like profile of a rather steep-pitched roof where a hayloft might be (and which actually creates our loft thus making the inglenook possible) then changing to a gentler slope where the animal stalls might be (which forms several of the porch overhangs, cutting out the high summer sun but allowing in the low winter sun …… creating the possibility for passive solar heating, (when the relatively low winter sun comes under the eaves). Nancy also paid great attention to detailing the alder paneling throughout the public rooms and the wall moldings e.g. there is a flat alder mold at the top of the wood paneling in the public area that continues unbroken throughout all the rooms including the bathrooms and shower areas. This creates a cohesive feeling throughout the house. But it is the wonderful light that pervades almost every room, which comes from north, east, south and west in the public areas and from at least 2 different walls in almost every room of the house (and 3 in the master bedroom). As I’ve grown older I have come to crave this kind of light in my Los Angeles home but didn’t understand the importance of it when I was younger. Cooking and entertaining is a joy in this house because of its informal layout and the inclusion of the kitchen in the main living area. When we get together as an extended family, we all contribute with the cooking and no one is left out of the conversations. This makes our mealtimes a real family affair. If we have a large party, we have several seating areas for people to gather and we can set up an extra table for dining or to serve as a buffet. It’s somewhat like a stage set where one can move things around to accommodate different needs. Nancy’s House (as it was often referred to by our mother who enjoyed the few times she was able to be there before she died) is a place of comfort to us, our 2 grown children as well as Nancy’s 2 grown children and her grandson. We enjoy gathering there for holidays, for skiing or summer recreation. The only drawback is that it’s a long drive or an expensive plane ride. Shirley Shapiro. Nancy's design and her life reflected her deepest values - living all-too-uncommon "common sense." Using natural, minimal means to achieve maximum effect. Honoring lasting values which are inherently beautiful and which weather naturally. She had no regard for what was trendy or selling in the shelter magazines. She didn't want to submit photos of the Ketchum house for publication in Sunset Magazine as I suggested it would be a great example of a vacation house. She avoided veneers and show. She made structures visible as a primary design motif since none of her buildings had to be fire-rated. 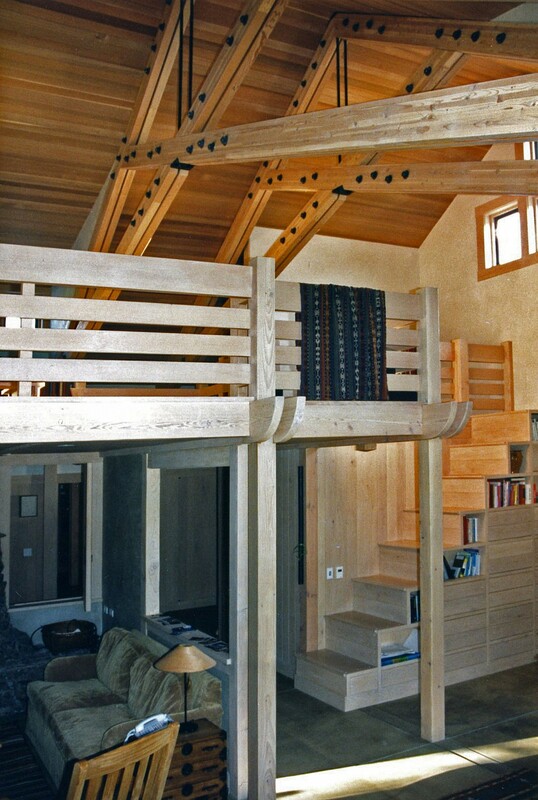 Developing a geometrical rhythm, similar to the tatami in traditional Japanese homes, with wood paneling and expansion scoring in poured concrete floors (see the living room photo, Wood River House, Ketchum) and wood work gave the houses a unity which was tranquil and inviting. 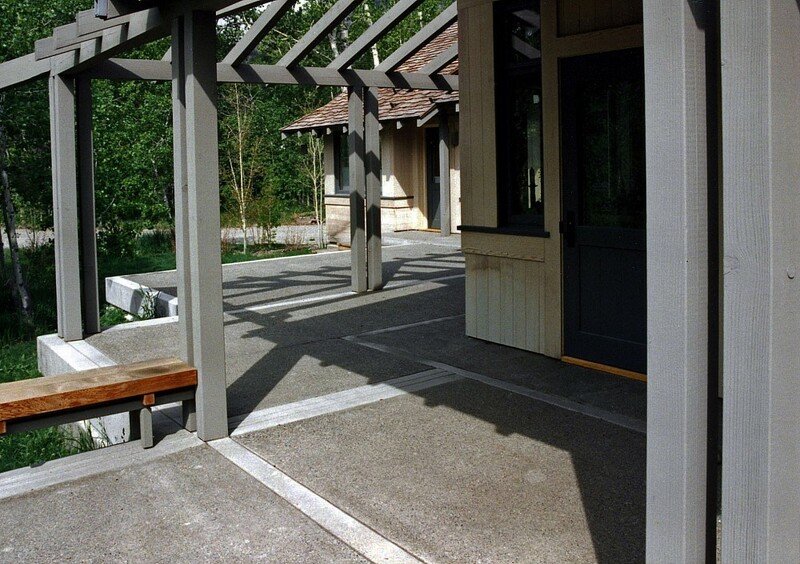 The gallery connecting the existing house and the new addition Nancy designed for Houston Cummings in Portola Valley in 1991. The horizontal wood bands are an element Nancy used in many spaces to create visual continuity. Plants and siting/landscape/micro-climate remained important factors in Nancy's designs all her career. 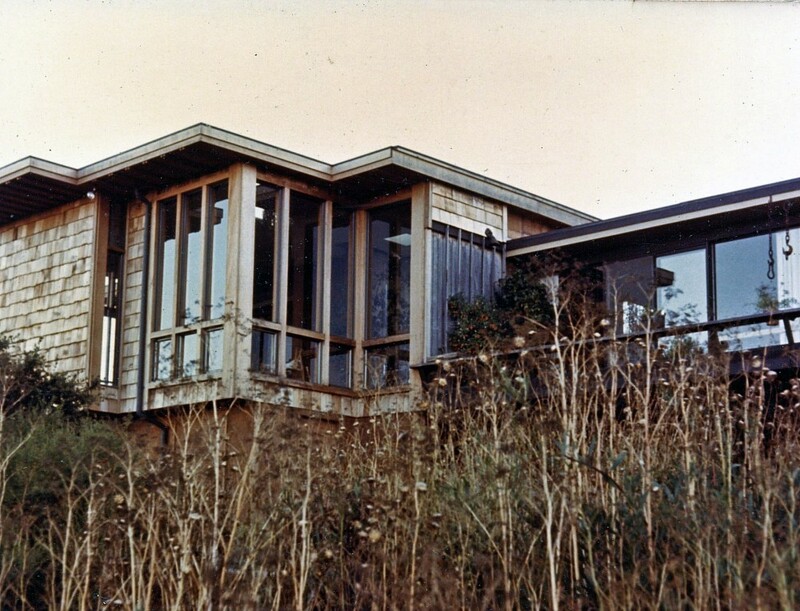 Her outdoor spaces were designed for year round conditions - with decks that did not look forlorn in the winter, to orienting windows to provide a protected connection to the outdoors when the sun low in the sky in winter. Most modern architecture shows outdoor decks, dining, pools, but if you really analyze it, most of the time you find it would be too sunny and hot, or too windy and cold. 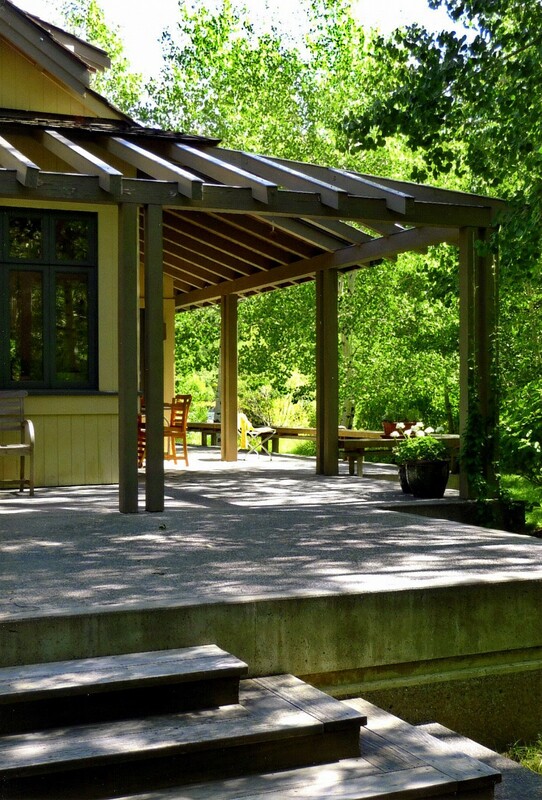 Nancy's outdoor spaces were designed to truly be comfortable for actual year round conditions. They are always integrated components of her houses. Houston shared Nancy's love for traditional Japanese aesthetics. While in Japan with the Navy in the 50s , he was struck by how "nothing needed to be ugly; there was beauty in even the most common things...down to the smallest cooking utensil." Houston says that some of that has been lost in Japan today, but that "Nancy had it." Houston still loves the spaces Nancy created. As in all her projects, the woodwork and craftsmanship are exquisite. The carpenter who worked on it told Houston, "I never expect to be given time to do something like that again in my career.” He and used to bring his girlfriends over to the house to show it to them. Houston said that neither he nor Nancy felt any compunction to follow conventional wisdom, which vexed the contractor who was used to doing things a standard way. Houston commented that Nancy was very good at "keeping her voice low and being very persuasive, but not giving an inch." The exterior of the Cummings house, showing strong Japanese elements. I treasure some of Nancy’s and my conversations during the last few years. We took a great road trip south on Route 1 in late fall of 2009 - to revisit Big Sur, San Simeon, and Ken Haggard and Polly Cooper at their country home in Santa Maria which is totally off the grid, near San Luis Obispo. We visited their passive solar design in a new synagogue just completed in SLO - an example of formerly residential passive design systems working at the larger scale of a public building. The congregation and the community were revitalized and members expressed joy in using their new building. Nancy did not hand out compliments profusely. She was gracious but somewhat reserved socially. She had strong opinions and principles which she would defend without being confrontational. She had unquenchable courage and steadfast will in the face of adversity - the more powerful for coming from such a gracious person. For those of us lucky enough to have known her personally, we will cherish our memories of her, her innate sense of style in every object, from what she wore, to how she built, from what she ate to her skepticism of bombast and jargon, her disdain for self-inflated Famous Architects. She used materials meticulously but wisely, with a light hand - simplicity trumps pretense. When I saw her the last time and knew her illness was in its last stages, I asked her what I could do for her. She didn't want books, music, food, flowers. I asked her if I could have her permission to write about her buildings and career. She was delighted. I was surprised and gratified that she readily agreed. We have always been frank with each other so I asked her if she was comfortable with how she and her children had decided to deal with her body. We had both considered how to deal with this design and specifications challenge and laughed together about the lack of truly sustainable options - legally, culturally, and scientifically. She mentioned two examples of end of life attitudes which had amused her - a book called Cadillac Desert - even though written in the 1980's it is still relevant today. She also mentioned a beautiful and little known Japanese movie - Departures and discussed how beautiful and surprising it was in detail. to be near her Helios. never letting him out of her sight. and the whole sky sparkles, enfolding her. Principal, Hood Miller Associates, Inc., founded 1977 in San Francisco. Photo Credits: Nancy's family, friends, and I regret that we cannot identify the photographers of the photos in this article which were in Nancy's archives. Please notify Bobbie Sue Hood (BHood@HoodMiller.com) or the OWA Newsletter Editor if you any information about the photographers. Footnotes. When I began recalling Nancy's story, I experienced a vivid brain dump of memories of the political circumstances and women's rights movement which stirred so powerfully in the 1970's. I pulled this peripheral commentary out into footnotes. These can be read sequentially as a "counter melody" to provide context to Nancy's life. (1)	Thanks to Gloria Steinem's absurd Dadaist, narcissistic campaign in Florida (a woman needs a man like a fish needs a bicycle…) the Equal Rights Amendment, which had initially had widespread support among all women, began to polarize "traditional women" and "libbers." The ERA failed to get the 3/4 of the states approval as required by the Constitution. Fortunately, we did win some federal legal victories like Title 9 - stipulating that schools and colleges must spend equal amounts of money for women's and men's sports. I was grateful when by 1992, "the year of the women" a gross overstatement. I was represented at the national level by Senators Dianne Feinstein and Barbara Boxer, and Nancy Pelosi who presented my Congressional District in San Francisco. For the most part, they have been exemplary: Nancy and Barbara voted against the 2003 American invasion of Iraq on baseless grounds. Dianne did much to save original old growth redwoods in northern California and desert in southern California, and eventually strongly protested the official US torture program as Chair of the Senate Intelligence Committee. (2)	Guests and the owners family could stay in Italian Renaissance guest houses, tour the zoo, ride horses under the long pergola for shade, tour the stables, service buildings, workers' housing, store, and port. They could luxuriate in rooms finished with museum quality finishes, furniture, and art. It was glorious excess as its aesthetic best for a powerful and discerning media baron. Sarah asked the guide who the architect was. The guide said Julia Morgan, but knew nothing further about her. Sarah knew that she had discovered how to spend the rest of her life: to discover who Julia Morgan was, how she became an architect in a man's world, to document and publish her findings like the good historian she was, to interview any still living people Morgan had known, hired, worked for, or photographed Morgan, and thereby to rescue an extraordinary early woman architect, who was unknown nationally, from the dust bin of history. At the time, Morgan was deliberately ignored in studies at UC Berkeley, compared with contemporary male architects. (3)	I read Sarah's many drafts and gave her many of my opinions about what distinguished Morgan's work from other practitioners of her time. I repeatedly insisted she make sure that her book would do justice to Julia Morgan's by publishing a top quality coffee table deserving book with excellent color photographs. I insisted she buy out her original editor/publisher and hire a first class architectural photographer who could and would transform the then prevailing opinion of Morgan's work as a second rate historical designer, and be technically sufficient for publishing her work in full color plates to do justice to Morgan's skills. Sarah followed this advice and hired an unknown, beginning architectural photographer, Richard Barnes, who exceeded my highest hopes. So when she published her great authoritative history, Julia Morgan Architect in 1988, the color photos and Sarah's exhaustive research, transformed her public reputation. Morgan's work from being interesting curiosity as a successful woman architect to a first rate architect of her time, worthy of comparison with her mentor Bernard Maybeck. The huge sales (for an architectural biography) and continuing editions of the popular work, which is still in print, launched Richard Barnes' career as one of the best photographers on the West Coast. In 2014, the American Institute of Architects gave Julia Morgan a posthumous Gold Metal for excellence - a well-deserved honor which required a change in the AIA's criteria that the award go only to living architects. They deserve credit for trying to make up for past discrimination - but it took a new generation of active women to push the award through. I received a Masters of Architecture from UC Berkeley in 1971. In 1974-6, I taught graduate urban design and architecture as a lecturer there. I lived in San Francisco and worked at MBT Architecture (now part of Perkins & Will). New to the city, and newly married, I decided to purchase and play a harpsichord to meet people in the city. An architect colleague who was fond of early music suggested that unlike my piano, harpsichord music required multiple musicians on other instruments so I could easily meet people by playing one! I soon discovered how difficult this fantasy would be even if I had nothing else to do, but in the meantime I visited the studio of a remarkable local harpsichord maker - Bjarne Dahl. When Bjarne learned I was an architect, he said women in architecture were so rare, wasn't it amazing that he had, as a small boy, lived with a woman architect during the early 1940's - Julia Morgan? And, wasn't it amazing that I was the second woman who had just asked him about Julia Morgan, - Sarah Boutelle! Bjarne's father, with the same name, was the drafting assistant for Morgan's onsite project architect Edward Hussey for the Honolulu Y! Bjarne the Elder lived in Honolulu during WW2 during construction of Morgan's YWCA. Young Bjarne remained in San Francisco because Honolulu was considered too dangerous for children after the Japanese bombed Pearl Harbor. Sarah Boutelle had asked Bjarne everything he knew about Julia Morgan. (Julia Morgan, Architect, page 109). Bjarne gave me Sarah's phone number. (4)	OWA was not the oldest women architects group. The AWA (Association of Women in Architecture was founded in LA in the 1940's) and was updated to deal with current circumstances. The 1970's saw growing numbers of women with professional degrees in architecture, law, and medicine began to speak up about unequal treatment and relatively low pay. We organized, very politely, to be treated fairly and also to advance in our professions. At first just glad to be hired, we quickly realized our need for jobs with equal growth potential and pay to develop professionally as architects. Despite some early progress, including a research project to interview male principals to identify the reasons they didn't hire and promote more women, we soon realized how subtle, culturally embedded, long term, and challenging the fight for equal pay, equal responsibility, and recognition would be. Today we have stunning success stories, including Cathy Simon, Marsha Maytum, and Allison Williams, all principals and CEO's with national and international reputations for design excellence and running successful offices. However, women architects in general remain at the lower end of the wage spectrum after 40 years. Many young women today - are they the smartest or most easily discouraged? - leave the profession soon after receiving professional degrees. The American Institute of Architects reports today that 34% of all women with professional degrees in architecture drop out of the field within 5 years of graduating - a stunning loss of talent and training. But the AIA, in the national backlash against affirmative action in about 1994 was happy to drop keeping records the number of women in the architecture, their positions, and their salaries. (5)	Unbelievably, this problem has resurged since the mid-1990's and become a major political debate today. Many women in professional schools have recently returned to taking long "breaks" from their professions because of propaganda extolling the superiority of children attended solely by their mothers rather than by "strangers." 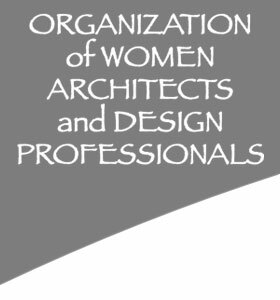 Many pioneer women architects, doctors, scientists, and attorneys were fighting for the opposite concept, that women could work, find ways to combine their professional responsibilities with motherhood, and develop the same expertise from lifetime employment that male and childless female architects had. This has been mislabeled by propaganda which calls it "having it all." No one has it all, but it's simply a matter of organization and money to combine children and career. This is an ongoing battle today. When Nancy enrolled at the age of 44 in the Option 3 Master of Architecture program at UC Berkeley, her children were still teenagers. (6)	The first two WSPA summer sessions were the first summer programs for prospective architecture students to try out architecture with experienced professionals and teachers at a college. Our vanguard program has since been copied by prestigious conventional architectural schools including Harvard and Berkeley. To my knowledge, none of them have offered free child care, individual counseling and consultation for related careers, and such a broad curriculum - as we did. WSPA unraveled a few years, after I was no longer active, for lack of a viable business plan and internal disagreements among those in charge. But the ideas in WSPA continue in conventional high quality graduate programs in design and architecture - a way to test the waters with sage advisers without taking the major plunge of graduate school tuition. The President of Biddeford College was so impressed when he participated in our jury at the end, and so delighted with our ideas for college programs and physical facility changes that he tried to obtain a grant to hire us to develop a plan for how to change the curriculum and buildings. We built an extraordinary model of the campus on the beach with sand, rocks, shells, and seaweed (available on video at the Sophia Smith Collection of Smith College). We named our enterprise Sand Castles and were all set to incorporate to take on our first project, when he called to say he had been unable to raise the funds for our master plan and program. The college and the town continued to decline and were quite derelict when I passed through in 2004. (7)	The first Brown Administration took on some traditional bastions of intentional or unintentional male prerogative. I was in charge of space programming for all state buildings and rewrote space allocations to be based on function and need rather than Civil Service rank. This effectively gave some women with low civil service rank the larger space they needed to run all the machines they used in those days while male colleagues luxuriated in excessively large and relatively empty conference room/offices based on their civil service rank and salary. I also programmed child care into state facilities with high turnover rates among clerical staff like the State Department of Justice Criminal Records, to help parents with small children. But, despite a favorable recommendation from the State Legislative Analyst that it would reduce absenteeism and high turnover in staff, conservative Republican Senators cut childcare out of the project authorization to preserve "the traditional family." The irony was that that was my goal in including child care. (8)	In retrospect, it is interesting to note how much women architects like Nancy helped to reform the general practice of architecture in California despite our relatively low standing and salaries. At OWA meetings in the Bay Area, we exchanged notes on unfair practices in the licensing process for architects. Back in the Bay Area, the early members of the OWA learned about special treatment of selected individuals, unequal treatment of men and women in the licensing process of the California Board of Architects (today known at the California Architects Board or CAB), and lack of transparency and accountability. I formed a committee at the AIASF to advocate for reform at the state level, and as I've always found the AIA in San Francisco, the local Executive Director Marie Farrell and chapter officers enthusiastically agreed with OWA's analysis. AIASF began to network with other AIA chapters to make the California licensing process fair and transparent. During the same period, I went to Sacramento to work with Sim van der Ryn who had been appointed State Architect by Governor Jerry Brown (during Brown's first administration in 1976). We were revolutionaries in many ways. I pushed for humane treatment of all employees, for space standards based on the employees' function and work rather than civil service rank, and for providing the large number of clerical workers (typically women) with windows and natural light rather than burying them in the basement or inner offices with no access to windows. The test itself was somewhat arbitrary and subject to interpretation. Amazingly, the response among men and women was unanimous - and new litigation passed quickly. This reform was for all licensees not just for women and minorities - a good strategy for more equal treatment under the law for women. Our success came surprisingly swiftly when we organized. (9)	Polly Cooper and I both grew up in and attended Little Rock Central High School, a then huge and excellent high school - my class had 714 people. We both sang in the a capella choir - which required competitive auditions. Polly was 3 years younger than I and also quite tall, so I gave her my choir robe in a ceremony when I left. We reconnected when she was finishing her masters degree in architecture at UC Berkeley (already having a masters degree from Harvard). Polly and Ken's first house had an evaporative pond on the roof for natural cooling in the desert. They have built and designed many houses which are totally off-the-grid. 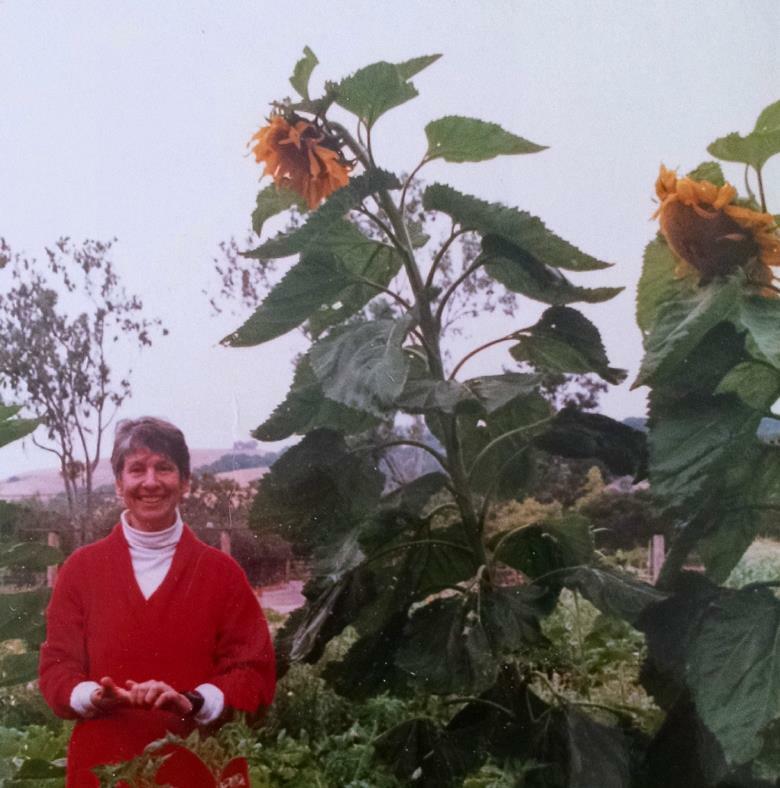 Polly taught environmental design at Cal Poly, and taught passive solar design at the 2nd WSPA summer session in Santa Cruz in 1976, which Nancy also attended. Small world for women architects in the 1970's! (10)	Interesting, this is the exact pattern in redwood in Julia Morgan's St. John Presbyterian Church on College Avenue which I happened upon when I lived nearby during architecture school. This building is so meticulously detailed - even the wood light fixtures comply - that I recognized it as a universal type - the perfect minimalist building. Though considered Japanese (as in Frank Lloyd Wright's buildings), it is actually a universal pattern which also heavily influenced Beaux Arts design in Paris. When I asked Sally Woodward, an architectural historian who taught at Berkeley who the architect was she replied - oh, it's just Julia Morgan, a second rate architect. Sally took over editing Sarah's book for new editions after Sarah retired. Sally went to the same publisher, design, format, and photographer for her book on Bernard Maybeck as Sarah's Julia Morgan Architect, which also helped Sally to introduce Maybeck, the Bay Area's greatest architect of the late 19th and early 20th centuries, and Julia Morgan's teacher, mentor, and co-architect for the Hearst Memorial Gym on the UC Berkeley campus, to a new generation of admirers. After the memorial, we will serve a light, informal lunch nearby on the Mills campus. Please arrive by 10:45 so that you can park and walk to the chapel. Parking is free and readily available on the Mills campus on Sundays. Just tell the guard at the entrance that you are attending a memorial. It would be helpful if you could let us know whether you plan to attend, and if you will be able to join us for lunch afterwards. Please also feel free to forward the information about the memorial to any of Nancy's other friends who might like to attend.